Begin with a clean nail, and add a layer of base coat. Next, at the base of the nail, add a thin coat of CG Cleopatra bringing it about halfway up the nail, and leaving a thin ridge of polish across the middle of the nail. Then, take CG Atlantis and apply a thin layer, beginning at the ridge of Cleopatra, and dragging it up to the tip. Add another thin layer of Cleopatra to the base of the nail, filling it in to the opacity desire, gently dragging the color up to the halfway point on the nail, again. 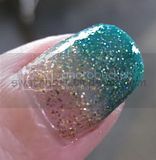 Next, take Atlantis and begin to build the color up at the tip of the nail, applying thin layers of color. 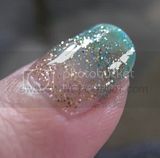 Then, add a little more Cleopatra to the center of the nail, dragging it downward to blend the color more. Continue to add very thin layers of Atlantis to get the desired level of opacity to the tip of the nail, dragging it down as far as desired for the ombré effect. Finally, add a layer of top coat and you're finished! ~Use verrry thin layers, especially near the point where the colors meet. Once the color is added, it's very hard to lighten the color without making it too thick on the nail. ~Don't wait too long when "melting" the colors together to create the ombré. They melt together better when on the wet side. ~Doing only one or two nails at a time seems to work best, as the polish is set to the right point when going back and forth between the two. Thank you so much for reading, and share with me your ombré combinations! i regret not buying atlantis now! great nails!